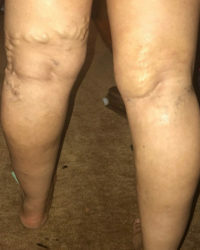 Varicose veins come in many shapes and sizes. They can be anything from tiny, red, thread-like veins crisscrossing your legs, to large ropey veins that bulge out dramatically, and everything in between. Part of what I love about veins is that no two patient’s veins are exactly alike. Treating so many different types of veins constantly challenges and fascinates me. Larger ropey veins that bulge out from the leg can be treated in a couple different ways. The two procedures that I generally offer patients with veins like this are ambulatory phlebectomy and ultrasound guided sclerotherapy. The goal of ambulatory phlebectomy is to remove the vein from leg using very small incisions less than 3 mm wide that travel down the path of the vein. Once the incision is made a small surgical hook is used to grab the vein and pull it out in small segments until the entire bulging vein is removed. The portion of the leg that is being worked on is anesthetized or numbed using local anesthetic. The patient is completely awake for the procedure and usually describes that they feel me doing something down on their leg, but it doesn’t hurt. We like to play music in our procedure room and chat to keep our patients at ease with everything we’re doing. 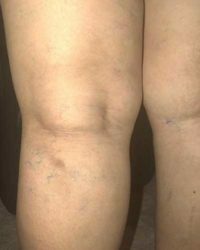 On the other hand, with ultrasound guided sclerotherapy the bulging vein remains in the leg and it’s destroyed from the inside out using an irritant medication that is injected into the diseased vein. Using ultrasound to locate my needle as it enters the varicose vein, I inject a sclerosant medication which irritates, damages, and destroys the cells that line the inside of the vein wall when it comes in contact with it. The vein wall collapses down on itself and starts to scar down. At first the bulging vein may feel hardened. 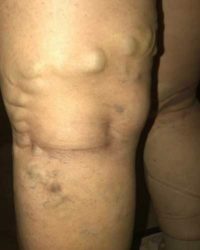 However, after a number of months, the body gradually resorbs the non-functioning vein and the bulging vein starts to disappear. For this procedure (as with all our procedures at Spartz Vein Clinic) patients are awake. Again, we do everything possible to keep patients as comfortable as possible. We’ll even let you pick the music! Both ambulatory phlebectomy and ultrasound guided sclerotherapy are excellent ways to treat large bulging veins that can cause pain, tenderness, and irritation. If you have large or small bulging veins and you would like to discuss possible treatment options for your legs please call Spartz Vein Clinic at (651) 797-6880 to set up an appointment or a free vein screen.